How to get rid of eyelash mites – Eyelash mites are tiny parasites that live in the hair follicles of the root of the eyelashes. While according to Websters dictionary most people have mites naturally, some people are allergic to them. Red eyes, swelling of the eyelid and skin or flaky skin rashes are common allergic reactions. 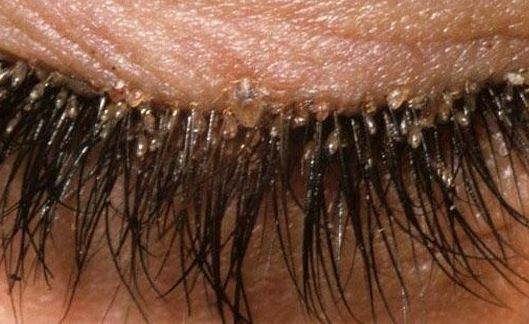 The infection that the eyelash mites can cause is known as demodectic. Treatment of the infection quickly and completely will help prevent future episodes. Wash your face and eye contour with a soft baby soap without tearing. Dilute baby soap with water to create a 50/50 solution. Rub gently with a washcloth twice a day. Apply a drop of tea tree oil diluted with water to each eyebrow, as well as a drop of each eyelash, as the mites that live in the eyebrows can easily get down into the lashes. Throw away all your eye makeup and buy new items. Avoid wearing any makeup for at least a week, to keep the area clean. Washing sheets and pillowcases on a weekly basis. Set up an appointment with your doctor if the problem persists. Your doctor may prescribe a topical antibiotic ointment to help kill the mites and fix the problem. Next post Is Last Summers Sunscreen still Effective?